Here is a recording as performed by the Martin Best Ensemble. Here is a performance by the American countertenor Russell Oberlin. Here is a recording of Paul Hillier singing Bernard's classic. The troubadors were wandering minstrels from the South of France who, it is believed, composed and sang their own poetry and music. Central to their poetry were the ideals of courtly love. Their topics also included political and moral themes, laments, satires and literary and social debates. The troubadours wrote in the local languages and in the so-called 'fixed forms" of French medieval poetry. Unlike medieval church music, the names of many of the secular composers are known. Their lyric was collected and the stories of their lives and personailities were immortalized in minibiographies, known as vidas, that were interspersed within these collections. Troubadours flourished during the twelfth and thirteenth century before the Catholic church's zeal in eliminating the Cathar movement with the Albigensian crusade (1202 - 1229) caused many of the troubadours to disperse. 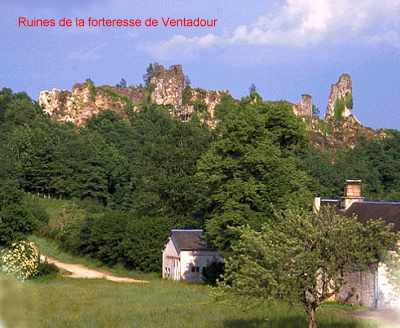 Bernard de Ventadorn was from the castle of Ventadorn in Limousin. He was a man from a poor family, the son of a servant who was an oven-tender and heated the oven to cook the bread for the castle. He grew handsome and skilled, and knew how to compose and sing, and he was courtly and educated. 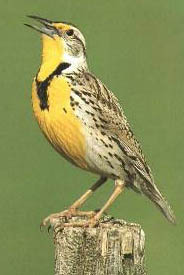 The Viscount Ventadorn, his lord, was greatly pleased with him and his composing and singing, and honored him greatly. Now,Viscount Ventadorn had a wife who was beautiful and gay and young and noble, and she was pleased with Sir Bernard and his songs, and she fell in love with him and he with her, so that he made his poems and songs about her, the love that he had for her and her noblesse. Their love lasted for a long time before the viscount the lady's husband, and the other people realized it. And when the viscount caught on, he distanced Sir Bernard from him and had his wife shut in under guard. Then he had the lady dismiss Sir Bernard, and made him agree to leave and depart from the district. So he left, and went to the Duchess of Normandy, who was young and of great nobility, and well-versed in worthiness and honor and eulogy. And she was most pleased with Sir Bernard's poems and songs, so she received, honored, and supported him and and gave him many great favors. He was at the court of the duchess for a long time and he fell in love with her and she with him, so Sir Bernard made many good songs about it. But King Henry of Enqland took her to wife and took her from Normandy and took her to England. 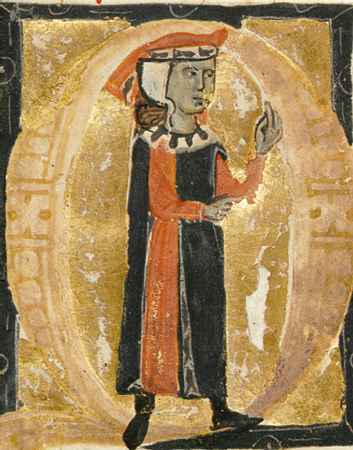 Sir Bernard stayed behind, sad and ailing, and he left Normandy and went to the good count Raymond of Toulouse, and was with him at his court until the count died. And when the count was dead, Sir Bernard abandoned the world, and composing and singing and the world's solace, and entered the order of Dalon and died there. And all that I have told you about him was told to me by Viscount Eble of Ventadorn, who was the son of the viscountess Sir Bernard loved so nuch. Can vei la lauzeta mover is perhaps Bernard's most popular song and was known even to Dante who paraphrased its opening in his Paradiso: "Like the small lark who wantons free in air, / First singing and then silent, as possessed / By the last sweetness that contented her, / So seemed to me the image, deep impressed / With the Eternal Pleasure, by whose will / Each thing in its own nature is expressed." Troubadour music was perhaps derived from the primary monophonic styles of chant. It differs, however, in a number of subtle ways. The melody is generally more closely allied with the poetic metrics and also it is generally organized in a strophic form - that is, every verse of poetry is set to the same music. The final verse, known as the tornada, is shorter than the others and uses only a portion of the music. The melody used for each strophe is usually determined by the form of the stanza, in that phrase length often corresponds to line length and melodic and lyrical cadences tend to coincide. Troubadour melodies can either repeat sections or be through-composed, that is lacking in refrain or repetition. Is this piece through-composed? There is little consensus as to the actual sound of troubadour music. Our recording performed by a member of Germany's Studio de Fruhen Musik under Thomas Binkley is performed monophonically. The listening chart below follows that recording. You can follow the score here. Can vei la lauzeta mover 0:00 Verse 1: The first half of the melody. It moves gently up to a high point before cadencing on the same note on which it began. Ai! 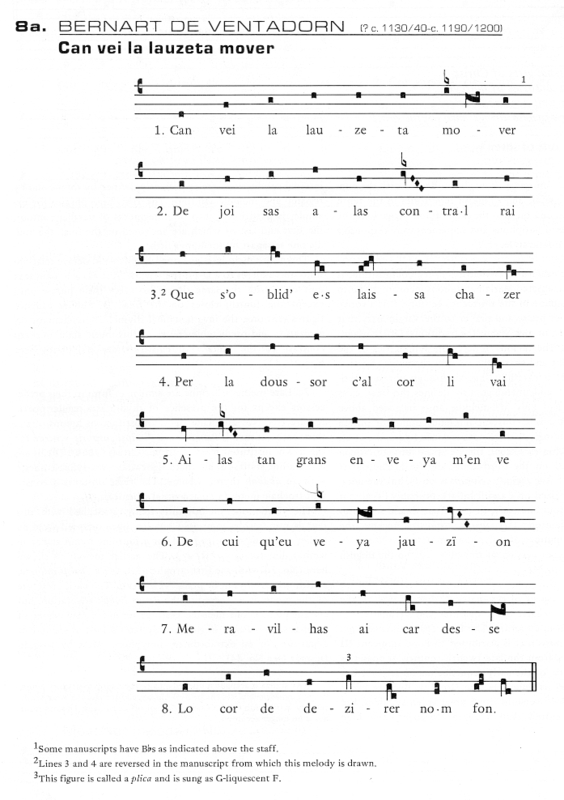 Tan grans enveya 0:24 Verse 1: The second half of the melody. It begins halfway between the high and low points of the first half and eventually cadences on the same note as the beginning of the entire melody. Ai, las! Tan cuidava saber 0:52 Verse 2: The structure is the same as verse 1. Anc non agui de me poder 1:43 Verse 3: The structure is the same as verse 1. De las domnas me dezesper 2:32 Verse 4: The structure is the same as verse 1. D'aisso's fa be femna parer 3:23 Verse 5: The structure is the same as verse 1. Merces es perduda, per ver, 4:15 Verse 6: The structure is the same as verse 1. Pus ab midons no.m pot valer 5:04 Verse 7: The structure is the same as verse 1. Tristeza, no.n auretz de me 5:54 Tornada: Melody starts at its second half. All creatures thaat I see happy. Does not melt away there and then with longing. Her from whom I may have nothing. But longing and a seeking heart. Into that mirror which so delights me. Car be sai c'atretals se son. For well I know that they are all alike. And what is forbdden her, she does. Unless it was that I applied too much pressure. No.n a ges, et on la querrai? Laisse morrir, que no l.aon. Has none: and where should I seek it now? How she lets me die, and will not come to my aid. Qu'eu l'am, ja mais no.lh o dirai. I shall not speak of love again. And go wretched into exile, not knowing where. Qu'eu m'en vau, chaitius, no sai on. E de joi e d'amor m'escon. Since I am going, wretched not knowing where. And flee from joy and from love.